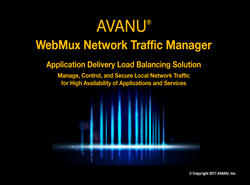 AVANU® announces a new generation of WebMux Network Traffic Manager™ models, an application delivery load balancing solution. The new WebMux network hardware appliances now meet a higher security level of the Federal Information Processing Standard (FIPS). WebMux complies with FIPS 140-2 Level 2 regulatory requirements with its digital monitoring and built-in physical intrusion protection. WebMux’s new upgraded and redesigned hardware architecture enhances performance and reliability. The accelerating trends of mobility, the Internet of Things (IoT), and application sophistication mean more and more burdens for the Internet. AVANU’s WebMux manages, controls, and secures local traffic reducing network latency and packet loss meeting today’s demands for high-availability, real-time interactions, and smooth streaming of multimedia content. WebMux provides a high valued and affordable enterprise-class application delivery load balancing solution for any size business. It is designed with a user-friendly interface making WebMux simple and fast to deploy and manage while meeting the most demanding load balancing requirements. Five new WebMux models A425, A525, A625, A725, and A825 replace the previous A500 and A600. Security features included in all WebMux hardware and Virtual for Cloud computing appliances include Automatic Attack Detection (AAD), Flood Control®, Smart DDoS protection, NAT/SNAT, TACACS+/LADP authentication, multiple address & port mapping (MAP™), IPv6 to IPv4, PCI DSS compliant, TCP SYN protections, HTTPS/SSH management, and up to 8192 bit TLS/SSL encryption. “All of our hardware and virtual network WebMux appliances offer the same robust application delivery load balancing and performance scalable features at easily affordable prices, simplifying the purchase decision. The new generation WebMux hardware models combine today’s higher performing components in a 64-bit architecture to provide the high performance and reliability necessary to overcome continuously evolving network challenges,” says Pamela Sun, President of AVANU. Service demands on today’s Internet have increased from the explosion of new media trends. One such trend is the proliferation unified communications (UC) platforms from the likes of Microsoft®, Oracle®, IBM®, Cisco®, HP®, Avaya®, and Siemens®, which require the services of a highly efficient, scalable, and secured load balancing solution. WebMux provides the high capacity, reliability, and availability to manage, control, and secure local traffic at IP layers 4 through 7 for TCP- and UDP-based applications such as these. AVANU’s WebMux is developed and manufactured in the United States complying with the Trade Agreements Act (TAA) guidelines. Hardware appliance models supports dual hot-swap power supplies and come with a 2-years product warranty and 1-year free technical support. WebMux Virtual appliances for Cloud computing environments (such as VMWare®, Microsoft Hyper-V®, Oracle VirtualBox®, and Citrix XEN®) also come with 1-year free technical support. Both WebMux hardware and Virtual appliances feature firmware v13.0. New WebMux hardware models will begin shipping in July 2017. AVANU is a leading developer of high valued products for the IT infrastructure and data center environments that are cost-effective, full-featured, and high performance. AVANU adds value by placing customers first with a focus on easy product user interface, robust product features, and excellence in customer support services. AVANU’s flagship product, the WebMux Network Traffic Manager, is an enterprise-class application load balancing solution for managing, controlling, and securing local network Layers 4-7 traffic. AVANU® founded in 1997 and based in San Jose, California USA is a privately held network infrastructure product developer with R&D, manufacturing, and production in the United States. Graduated from the U.S. SBA 8(a)/SDB program in 2015. AVANU, WebMux Network Traffic Manager, Flood Control, AVANUAdvantage, AVANews, AVE, BlogWithUs!, DNSMux, MAP are trademarks or registered trademarks of AVANU, Inc. It is all about the user experience on your network and keeping everyone connected is a service mark of AVANU, Inc.